Phantasy Star Universe: Ambition of the Illuminus, called Phantasy Star Universe: Illuminus no Yabou (ファンタシースターユニバース イルミナスの野望) in Japan, is the first expansion of Sonic Team's internationally popular online RPG Phantasy Star Universe, available for the PC, PlayStation 2 and Xbox 360 via the Xbox Live Arcade. Ambition of the Illuminus picks right up where the story left off in Phantasy Star Universe. Shortly after the defeat of Magashi and the Endrum Collective, a mysterious group known as the Illuminus have appeared, and threatens to exterminate all non-human races. The GUARDIANS themselves are under attack, and Ethan Waber is now wanted for an attempted assassination. Determined to find Ethan at any cost is GUARDIAN instructor, Laia Martinez. As a new GUARDIAN receiving guidance from Laia, you must search for Ethan and uncover the truth. A new series of online chapters introduced by the expansion, having completed their training and become full-fledged GUARDIANS, players take the reigns as instructors, passing on their knowledge to younger recruits all the while investigating the evil Illuminus organization. In addition, all of Episode 2 is available in the offline Story Mode on the PC and PlayStation 2 versions of the game, and limited edition collectables are given away as mission rewards, and some are given to your character at the beginning of the game. Ambition of the Illuminus introduced numerous new features to Phantasy Star Universe including new weapons, photon arts, missions, clothing, enemies and more. Four new weapons categories were added with this expansion, giving players an even larger arsenal at their disposal as they continue their fight against the deadly SEED and human supremacist organization, the Illuminus. Whips are single-handed striking weapons which allow the user to attack multiple enemies within a certain radius. Though not the strongest weapon, whips are excellent for inflicting status effects on enemies. Slicers are single-handed striking weapons which allow players to attack from a distance. When swung, slicers launch a photon blade which will home in on its target. RCSMs, or ranged combat support machines, are single-handed ranged weapons which hover over their user's left shoulder. Though these weapons share their appearance with MAGs from Phantasy Star Online, RCSMs actually are weapons which automatically fire shots at enemies within range. TCSMs, short for TECHNIC combat support machines, are single-handed TECHNIC-casting weapons. As with RCSMs, these weapons have similar designs to certain MAGs from Phantasy Star Online, though they really act as left-handed wands, allowing players to link up to two TECHNICs to them. Building on the original game's ten GUARDIANS types, Ambition of the Illuminus introduced two new types and promises at least three more in the near future. Acrofighters excel in the use of single-handed striking weapons. This type exhibits increased attack speed, giving players the ability to move in for an attack quickly. Though specializing in striking weapons, Acrofighters are capable of using many ranged weapons as well. Acrotechers are specialists at supporting party members as they are the one type with access to the highest level of support TECHNICs. This type casts TECHNICs faster than normal, but also performs well with various striking and ranged weapons. Though currently available only in Japan, three more new types will be released in the coming months: Fighmaster, Gunmaster and Masterforce. As their names suggest, these types are specialists in one specific field of battle, thus granting them outstanding abilities. The universe of Gurhal continues to grow as Ambition of the Illuminus has introduced numerous new areas, missions and lobbies to the system's three planets. A few areas of interest include the Habirao Forbidden District, a mysterious forest on Neudaiz filled with enormous mushrooms and an unusually high concentration of photon in the air, and Old Rozenom City, a once-thriving metropolis that was devastated by the crash landing of the GUARDIANS Colony, an act for which the Illuminus were responsible. In all, over twelve new areas have been added, including the forest, caves, mines and ruins, fan-favorites from Phantasy Star Online. While not running missions with other players, GUARDIANS can relax and chat with their friends in some of the expansion's new lobbies. These include Paracabana Coast, a beach front resort on Parum, Shitenkaku, a beautiful shrine at the summit of Neudaiz's Mt. Ohtoku, and Casino Voloyal, a popular casino in the Vio Tonga area of Moatoob. Released initially in Japan on September 27, 2007, for PlayStation 2 and PC, subsequent territorial releases followed on November 20, 2007 along with an XBLA-exclusive Japanese release of the 360 port, when North America received the expansion for all three platforms. This date also marked the worldwide release of the Xbox 360 version as it was available for download through Microsoft's Xbox Live service. Europe received the PC and PlayStation 2 versions of Ambition of the Illuminus a few months later, on January 11, 2008, and finally it reached Australia on February 7, 2008. Although it is an expansion pack, the PC and PlayStation 2 versions of Ambition of the Illuminus are standalone and do not require the original game to play. The Xbox 360 version, however, does require the original disc due to the expansion being downloadable content. On April 1, 2010 at 12:00 PDT, Sega of America shut down the online servers of the PlayStation 2 and PC versions of the game with warning at the start of the year. Starting late January, the game was made free to play for anyone who had a paying account in the past on the game and all subscriptions were cancelled. This lead to a gigantic burst in population in the universes, not seen since the release of the game. The Japanese Playstation 2 support was dropped in mid 2011 which allowed the PC version to bring in new additions, items, armor, weapons and areas from Phantasy Star Portable 2 until it's closure in September 2012. On June 8, 2012 SEGA announced that the Xbox 360 servers of the game would be shutting down September 6, 2012 at 11:00 p.m. PDT. For the remaining months players were granted various bonuses for many things. Anyone who still had an active subscription after the servers closed were refunded by Microsoft on a prorated basis. It was said that SEGA wanted the last months of the Xbox 360 servers to be free of charge but that Microsoft did not comply with the request. On July 7, 2012 it was announced on the official Japanese Phantasy Star Universe website that the Japanese PC servers for Phantasy Star Universe would be shutting down at midnight JST on September 27, 2012. On August 28, 2012 GUARDIANS Licenses, game keys, and game keys for Ambition of the Illuminus were not available to purchase anymore. Following the maintenance that happened on August 30, 2012 all players were given access to premium course features even if they had never bought a GUARDIANS License beforehand. After the server closer PSU ID's were no longer able to be created and players were no longer able to purchase GUARDIANS Cash. Following the closure players had the option to transfer their money to Phantasy Star Online 2 or have it refunded as WebMoney. 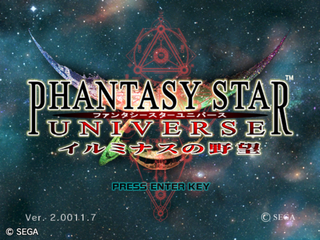 August 2012 was the last month that automatic renewers were charged for this version of Phantasy Star Universe and until the server closed various bonuses had been put in place. Once the servers closed all official servers for the game worldwide where gone. The story mode for the PlayStation 2 version is still accessible however as that can be played offline. CG Movies: VE R&D Dept. CG Movie: Jet Studio Inc.
Modelling: Sega (Shanghai) Software Co. Ltd.
Main article: Phantasy Star Universe: Ambition of the Illuminus/Magazine articles.